I remember reading once that as a young writer, Stephen King had a nail above his desk that he attached all his rejection slips to (I may have read this in his excellent writing memoir, On Writing). In those early days, he had a lot of rejections, and the hanging stack was thick. I read about that many years after I had first begun writing, but before I had ventured into submitting anything for possible publication. I remembered thinking: I want that thick stack of rejections. Maybe that was a strange thought, but what I meant was that I wanted to be in the game, and I wanted proof of my involvement. On some level, I suppose those rejection letters meant a strange kind of validation as a writer. They were war wounds. The point is clear: rejections are part of writing, as much as thinking up ideas, constructing characters, deciding on setting and tone, and bringing resolution to our plots. Rejections tell you you’re involved; they tell you you’re creating something, you’re practicing your art. So, collect them up. If you’re gutsy, place them prominently above your writing desk as King did. Count them. Be proud of them. My rejection list has grown fat over the last several years. Staring at those files on my flash drive, and dragging one more over to the “Rejected” folder, makes it all the sweeter when I can drag an acceptance over into the leaner “Published” folder. I’m no Stephen King, I’m no Sylvia Plath, but we are playing the same game. This entry was posted in Prairie L. Markussen and tagged art, authors, rejection, writing. Bookmark the permalink. I coach youth baseball. No matter what anybody says, it *IS* about winning (otherwise, why bother playing in a competitive sport?). After a loss, one of the things I stress to my team is that in life you learn more from your losses than from your victories. It’s about how you respond to the difficulties, the losses, and how you come away from them. Last season was a tough one for us in that we lost a lot more than we won. The kids learned a lot from this, but the problem actually became that they started “trying not to lose”. In other areas of life this might be called “selling out” or something. Basically, by trying not to lose, they essentially guaranteed that they could not win. They became timid on the field. They didn’t want to swing the bat and miss the ball and as a result they didn’t get hits. They didn’t want to have a ball fly over their heads in the outfield and as a result they played so deep that everything fell in well in front of them. 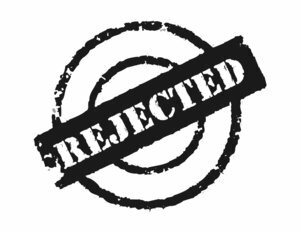 The point is that rejections are part of our writing game and if we allow them to bring us down and make us try to avoid getting more rejections… we will be more likely to not find that success at all. While I don’t WANT any more rejections, the reality is that each one comes with a little bit of information that will help me be better at this craft and as a result will help me to start hanging acceptances up on the wall, too. What a positive view of a painful part of writing.